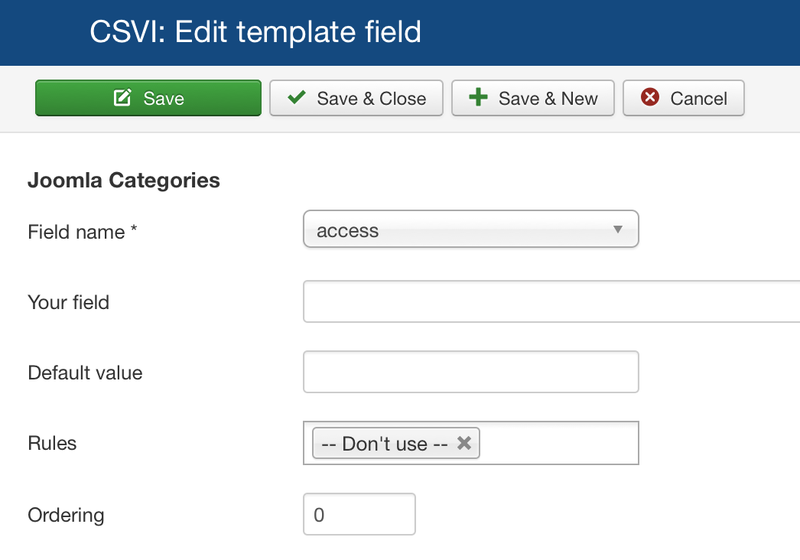 Template fields are needed by CSVI to know which fields you want to import/export. After clicking the New button you will get a new screen to add your field. The screen you will see depends on your template. Select the field that CSVI knows. A full list of fields can be found on the Available Fields page. CSVWhen using CSV files with fields you want to combine, set the Field name to combine and in Your field enter the name of the field in your CSV file.XMLEnter the full XML node path where the data is to be found. Unsure which path to use, use the Analyzer to see how CSVI reads your XML file. Enter a default value.This value will be used when the field in the import file is empty. Choose the rules to apply to the field. Enter the order the field should be in. Enter a custom column header. This header will be used instead of the field name. Enter a default value. This value will be used if the export finds no value in the database. Only used for XML. Set this to yes if your field requires CDATA tags in the XML output file. Set if the field should be exported. If you are combining fields, set this to No to prevent this field from being added to the export file. The field will still be used for the rule operations. After you have filled in all the fields click on one of the Save buttons to store the field. You can add as many fields as you need. 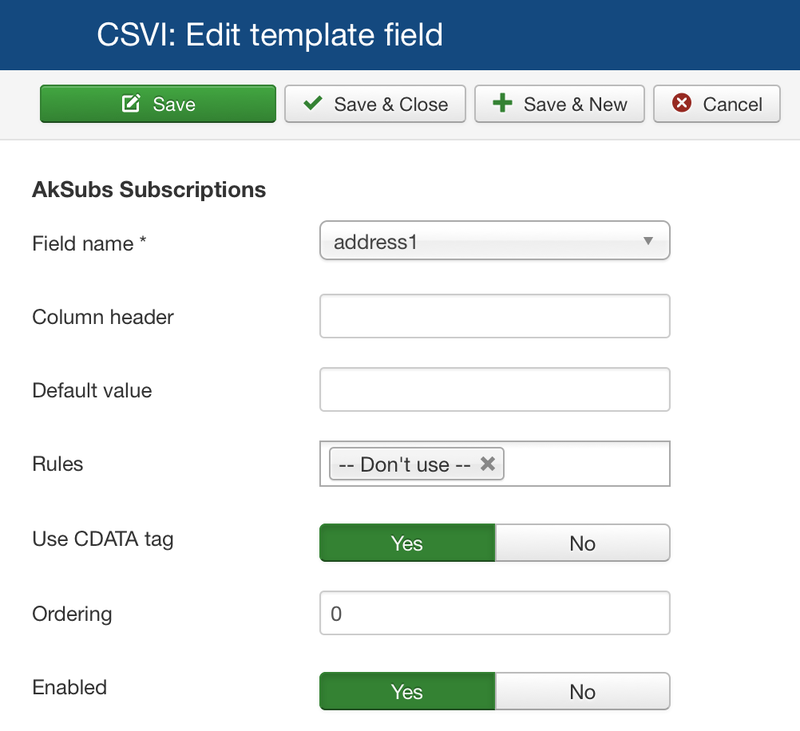 The Quick Add button can be used to quickly add multiple fields to your template. You can select one ore more fields form the list and then click the Add fields button. At first only the Cancel button is visible, the other buttons will appear as soon as a field is selected. 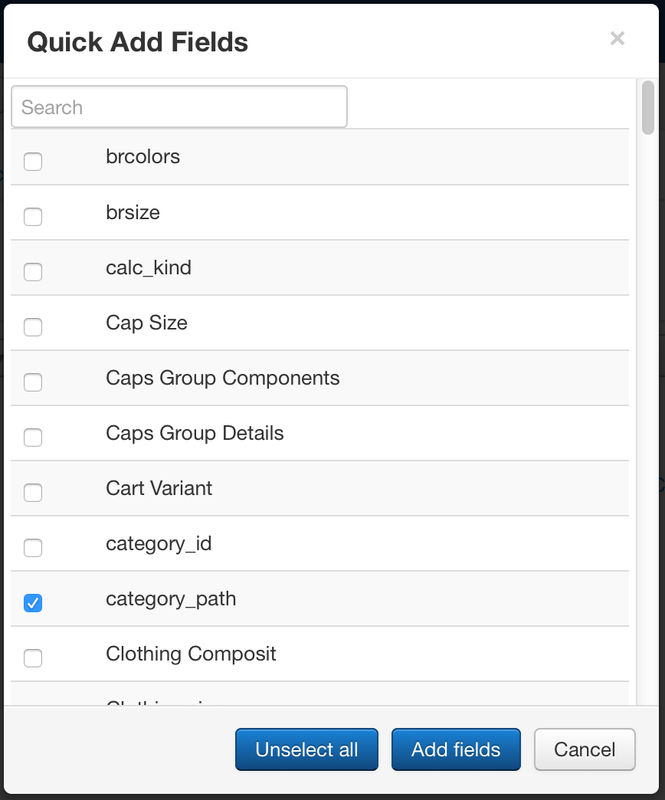 The search box at the top will filter the list of fields, this will help to locate fields faster when you have a long list. Previous selected fields will not be lost, they are just hidden while you search. If you want to edit one of the fields after they have been added, you can either click on the field name or on tick the box and click on the Edit button in the toolbar.